Expert ice advice – A go-to diamond guide for those approaching this summer’s wedding season without a clue. A ring is meant to be a reminder, a symbol of eternal commitment. But for some brides-to-be, a ring is also either a status symbol (“Look how loaded my guy is”) or a measurement of his love (“Look how much he loves me”). Before taking that terrifying trip to the jeweler, first determine your budget and stick to it. You chose her for eternity, but that doesn’t mean you have to spend that much time paying for it. There’s nothing romantic about steeping yourself into deep debt. Second, prioritize your five Cs: color, cut, clarity, carat weight and cost. What element is more important to you? The rule about spending two months’ salary isn’t set in stone, even if roughly 60 percent of U.S. men and women say it’s “appropriate.” The fact is, the world’s leading diamond company, DeBeers, came up with the notion as a 1940’s marketing campaign. By that rule, if you earn $30,000 a year, your net pay dictates you should drop about $3,750; for $40,000 it’s $5,000 a ring; for $50,000 it’s a $6,200 piece of ice. The rule may be over the top, but skimping on an item your wife will wear for the rest of her life is not a good start, either. It will always be in front of her eyes, at arm’s length, an extension of her physical self. A peer-reviewed Rutgers University study says the mean U.S. engagement ring is $3,867.55 — 11 percent of a man’s average salary. (That number, however, is likely to be lower for Mormons who marry younger than their counterparts; about 40 percent of couples in the study were 30 or older.) Women participate in choosing the ring 43 percent of the time, which increased the average cost of a ring by $133. $200 to $550 for a quarter carat or less, in a 10k gold setting — the minimum karat that can still be considered gold. Brilliant/Round: It’s classic. It’s the most popular. It’s 58 facets make it the most brilliant of cuts, according to calculations of mathematician Marcel Tolkowsky in 1919. Princess: It’s the second most popular — after the round — and less expensive than the round because it’s easier to create. This relatively newer square shape can have anywhere from 49 to 144 facets. Extra sides increase sparkle factor and make flaws less noticeable. Asscher: This square version reached its height of popularity in the 1930s, but with the return of fashion’s fondness for vintage and antique, its back. Emerald: rectangular with cropped corners. It’s large table is the best for showcasing a diamond’s clarity. Heart: For those who find sleeves a cumbersome place to keep their heart. It’s pear shaped with a top cleft and considered the most romantic. Marquise: A clever cut with a few tricks. The pointed oval makes a diamond appear larger and makes fingers appear longer and leaner. Oval: The elongated, round shape gives it noteworthy brilliance. And, like the marquise, it can flatter shorter fingers. Radiant: This rectangular stone with trimmed corners has a leg up on the emerald cut, with 70 facets on its underside to maximize light refraction. Selecting the perfect size a game of trade-offs. Size is largely dependent on your budget and how persnickety you are — or she is — about clarity, cut and color. The less fussy you are the larger diamond you can afford. Lately, the national average engagement diamond is around 0.38 carats, up from the 1970s when it was about .25 carats, according to James Greene, master gemologist appraiser. A one-carat diamond usually runs between $3,000 and $9,000, depending on its brilliance. Because you’re not likely Saudi Arabian royalty you probably can’t afford both the largest and most brilliant rock, so you must ask what is more important. Size over brilliance? Brilliance over size? Or an upper-end combination of all the criteria: a half-carat, round cut, VVS2, E colored “good cut” for about $1,800? Always ask to see your diamond under at least a 10x gem microscope for a true view of a diamond’s clarity. Never buy from a store that grades their own diamonds. Grading your own stones is the equivalent of writing your own report card. 4 carat might actually weigh between .69 and .81 carat. Look for a diamond with proper certification such as GIA or AGS, which will not certify fracture-filled diamonds. 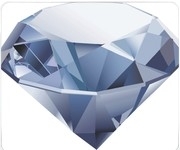 Work with a direct diamond importer. Middlemen can be expensive. Be comfortable with the place you buy your ring. Your fiancee will likely return for repairs, cleanings and sizings. Appraisals, often inflated by 100 percent, are for insurance only and shouldn’t be a sales tool. Don’t be pressured into buying quick. Diamonds are millions of years old; an extra week or two won’t hurt. The smaller and fewer the flaws, inclusions that can be observed under 10x magnification, the more perfect the diamond. The Gemological Institute of America developed an 11-grade clarity scale to rank diamond clarity, ranging from FL (flawless) where a skilled grader can’t observe any blemishes or inclusions, to I1, I2 and I3 where inclusions are obvious and may affect transparency. Most diamonds fall under the VS (very slightly included) or SI (slightly included) categories, and flawless diamonds are so rare, most jewelers have never seen one. So, ladies, it’s probably in your best interest not to mention such a thing as a flawless diamond to your sweetheart, or he may feel obligated to go to the ends of earth — and your soon-to-be-shared bank account — to get one. Who says too much of something is always a bad thing? In diamonds, light coloring can detract from the worth of the gem. Lighter tones of yellow and brown are discouraged as most jewel diamonds are nearly colorless. However, highly-colored diamonds, in yellow or blue, can be prized for their interesting hues. Colors D, E and F are colorless; G, H, I and J are nearly colorless; K, L and M are faint yellow; N though Z are light yellow. And darker pink and yellow hues are considered rare and precious. MormonTimes.com is produced by the Deseret News in Salt Lake City, Utah. It is not an official publication of The Church of Jesus Christ of Latter-day Saints.